Amar Baramu carried his 70-year-old mother on his back for five hours, then rode with her on a bus for 12 more, to get her to a hospital for the head wound she suffered during the earthquake. Helicopter pilot Subek Shrestha has flown more than 300 villagers to get medical care. 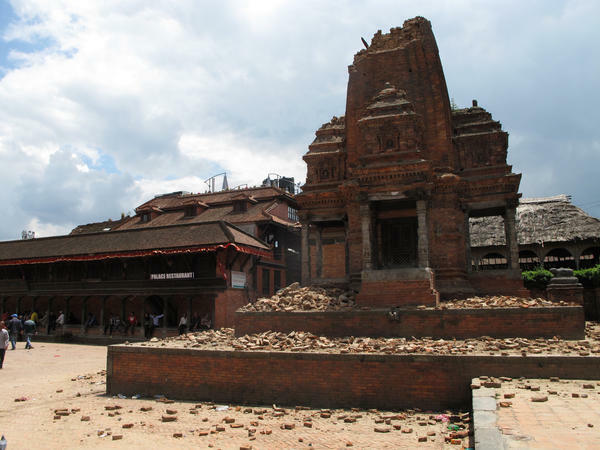 A post-earthquake scene in Bhaktapur, the ancient town outside Kathmandu that's a tourist attraction. He carried his 70-year-old mother on his back for five hours. Then he traveled with her by bus for 12 more. She suffered a severe head injury when the earthquake rumbled through her village of Thumi. He was trying to get her to a hospital in the Gorkha district in northern-central Nepal. Like many residents of Nepal's remote villages, Amar Baramu could be forgiven for thinking that cries for help have gone unheard. As the relief operation enters its sixth day, aid workers are just beginning to get to the far-off northern reaches of Gorkha, about a five-hour drive from Kathmandu. Difficult terrain, blocked roads and government confusion have slowed the effort. I met Baramu, who's 52, as he sat on a bench in the Gorkha District Hospital, which has been turned into a triage ward for earthquake victims and a staging ground for international relief organizations. A physician from Doctors Without Borders hovered over his mother, Aitimaya, checking her injury. Amar's forehead was creased with worry. "There was violent shaking it seemed for 15 minutes," he said. "The older people like my mother couldn't rush out of their houses and they were badly hurt. Five days later no relief has reached us. We made shelters from leaves, straw and our clothing. "All I have left are the clothes I'm wearing. I don't know what to do," he said, eyes welling with tears. "I came here to ask for help." Villagers like Aitimaya and her son are connected to the outside world by a single dirt road. In normal circumstances these byways are gullied and death-defying. Reported landslides have made them impassable. The only way to reach the decimated villages is by helicopter, a commodity in short supply in impoverished Nepal. Pilot Subek Shrestha says that weather permitting — and often this week it has not been — he's been ferrying supplies across the Gorkha district, including villages that sat on the catastrophic epicenter. "Roads are blocked, no communication, and the area is still shaking, still shaking," Shrestha says. He shows a photo of the village Laprak, one of the most devastated in the area. It looks like a war zone. The houses are shattered and lying in heaps. Nothing looks like it's standing. "Each and every village nearby this village — same as this, no houses standing," he says. In the small chopper requisitioned by the government Shrestha has transported between 300 and 400 people in critical condition to nearby hospitals. Those who remain are seeking shelter in their ruined villages. I ask him how many people in the area need a tent. "All of them, all of them," he says. Yet there is hope, even in the middle of a disaster. A medical team from the Swiss Agency for Development and Cooperation has arrived to focus on the needs of mothers and children. "Even just a few minutes ago, a lady delivered," says the team's chief, Dr. Olivier Hagon. "That is important: not all the time casualties or surgical cases. Life is going on." Rescuers in Nepal are starting to reach the most remote villages now six days after the earthquake there. More than 5,000 people are confirmed dead and thousands more are still unaccounted for. NPR's Julie McCarthy traveled to Gorkha, the epicenter of the quake, and found difficult terrain, blocked roads and landslides slowing disaster relief. JULIE MCCARTHY, BYLINE: Quake victims in the northern reaches of Gorkha - a district in the center of Nepal, a five-hour drive from Kathmandu - could be forgiven for thinking their cries for help have gone unheard. Miraculously, 70-year-old Aitimaya Baramu made it from her shattered village of Thumi here to the Gorkha District Hospital - turned triage ward and staging ground for humanitarian groups. A physician from Doctors Without Borders hovers over Aitimaya, inspecting her head injury while an IV drains into her bony arm. Stretched out on a dirty mattress, the only motion she can muster is a limp swat at the flies. Her son, Amar, sits nearby, his forehead creased with worry. 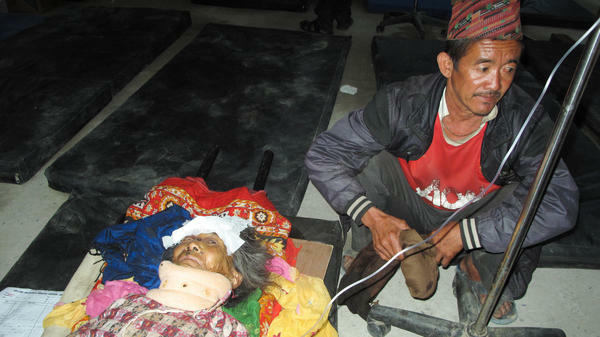 To save his mother, Amar, who is 52, said he had to carry her on his back for five hours then travel by bus another 12. Disheveled and exhausted, he says not a single house is left habitable in his village. AMAR BARAMU: (Foreign language spoken). MCCARTHY: "There was violent shaking it seemed for 15 minutes," Amar said. "The older people couldn't rush out of their houses, and they were badly injured like my mother. Five days later, no relief has reached us. We made shelters from leaves, straw and our clothes. All I have left are the clothes I'm wearing. I don't know what to do," he says, eyes welling with tears. "I came here to ask for help." Villagers like Aitimaya and her son are connected to the outside world by a single dirt road. In normal circumstances, these byways are gullied and death-defying. Landslides have made them impassible. The only way to reach the cutoff, decimated villages is via helicopter. 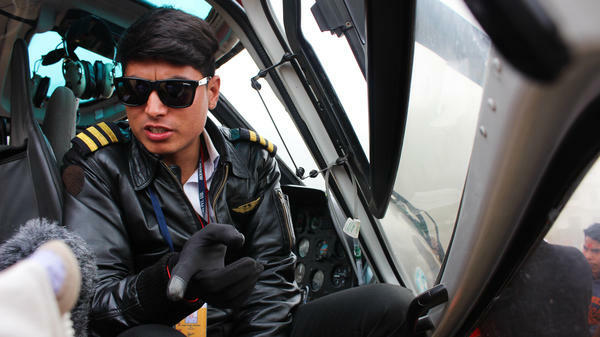 Aircraft in short supply in impoverished Nepal, pilot Subek Shrestha says he's been ferrying supplies to the devastated villages of Gorkha district at the epicenter of the quake. SUBEK SHRESTHA: Roads are blocked. No communications and the areas are still shaking, still shaking. MCCARTHY: Subek the pilot has shown us a picture of the village Laprak, which is one of the most devastated in the area. And it looks like a war zone. The houses are shattered and lying in - just in heaps. Nothing looks like it's standing. SHRESTHA: Yeah, nothing there. In each and every village - same as this - no houses standing. MCCARTHY: In the small chopper requisitioned by the government, Subek has transported out between 300 and 400 people who need critical medical attention. The remainder, he says, seek shelter. How many people are just not under any tent? What's your guess? SHRESTHA: All of them, all of them. MCCARTHY: None of them have tents. MCCARTHY: International aid agencies are now on the ground working alongside Nepalese authorities. A medical team from Switzerland just arrived to focus on the needs of mothers and children. Chief of the team, Olivia Hagon, says their work offers a different perspective on the crisis. OLIVIA HAGON: Just to consider also that during disaster, a lot of pregnant women deliver. Even a few minutes ago, a lady delivered. That is very important to things - not all the time to casualties or surgical case, but also to think about life is going on. MCCARTHY: That continuum is playing out in Gorkha, the home of the Gurkhas, the renowned soldiers recruited by the British and Indian armies. The victims of these inaccessible mountain villages will need all of their fabled resilience and more to pull through. Julie McCarthy, NPR News, the Gorkha district of Nepal. Transcript provided by NPR, Copyright NPR.